A great old jig that I first played with the legendary Clare piper Willie Clancy. It seems appropriate that Padraic Mac Mathúna, son of Ciarán Mac Mathúna, the radio and television presenter, should play it with me for this collection. Padraic spent much of his youth in Miltown Malbay where Willie Clancy lived, and Padraic's playing on the pipes is certainly a musical reflection of the nuances of Willie Clancy's music. Hospitality is at its best in the home of Padraic, his good wife Anne, and their lovely children. Sandy and I often reminisced about the evening we spent with them in Dublin, which was topped off when the man himself, Ciarán Mac Mathúna, shared a wonderful dinner with all of us. 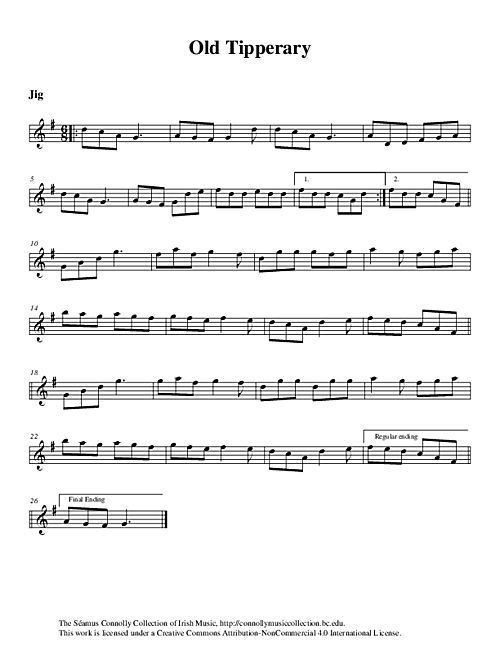 Mac Mathúna, Padraic (uilleann pipes) and Connolly, Séamus (fiddle), “Old Tipperary,” The Séamus Connolly Collection of Irish Music, accessed April 20, 2019, https://connollymusiccollection.bc.edu/document/471.